Back pain is one of the most common health complaints among adults in the US. From 75-80% of individuals will suffer from lower back pain sometime in their lives. Symptoms of back pain include shooting or stabbing pains in the back, limited mobility, and/or pain that radiates down the leg. The majority of individuals experiencing back pain will become more comfortable within days or weeks without medical treatment. Some people however may experience chronic pain lasting 2-3 months or more. Nonetheless, all low back pain results in major economic and social repercussions for both sufferers and society. There is no known cause of the pain in approximately 90% of patients; it is what is termed “idiopathic”. However, sitting too long or doing a physical task incorrectly may trigger back problems. The lack of physical activity, excess weight, genetics and the physical demands of a job also contribute to lower back pain. Sedentary lifestyles are associated with 1.41 times greater risk of developing back pain. Individuals that are not physically active, are 1.23 times more likely to develop lower back pain. Individuals with back pain frequently have the same anatomically “abnormalities” as people without back complaints. Patients with occupation-related back pain who had magnetic resonance imaging (MRI) of their back were 8 times more likely to get surgery as those who had just x-rays. 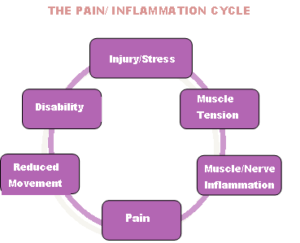 Since symptoms do not correlate with imaging testing, many practitioners will not recommend imaging testing within the first six weeks of pain (unless there is a strong suspicion of other underlying conditions)..
Inflammation in the body is tightly regulated, involving signals that initiate and maintain inflammation and others that turn inflammation off. Imbalances between the two, lead to unchecked inflammation. Inflammation causes pain, and pain causes more inflammation. When the body hurts, inflammatory cytokines, immune molecules, are triggered that initiate the healing process. The release in the spinal cord of certain cytokines is associated with inflamed nerves and pain. CRP (C-reactive protein) is a biological marker of inflammation. Individuals with the most severe lower back pain have nearly twice the amount of CRP levels as those with less pain. Back surgery may relieve some causes of back pain, but it’s rarely necessary. Most back pain resolves on its own. There are a number of treatments that are used to reduce inflammation and pain: nonsteroidal anti-inflammatory drugs (NSAIDS), epidural steroid injections, topically applied creams or sprays, and for some, hot and cold packs. One of the best approaches to relieving lower back pain is exercise, especially McKenzie exercises [find the exercise best for you on YouTube]. Individuals that do back exercises find significant relief and if practiced consistently will find that their backs will be strengthened and they will have less discomfort. The key to healing is a balanced immune response. The body needs the right amount of inflammation to heal, but too much inflammation results in illness. If you want to change how you feel, contact Dr. Hellen. No fee is charged for the first 30 minutes of consultation. Dr. Hellen may be contacted by using this form or calling: 302.265.3870 (ET-USA).